"Forget France. 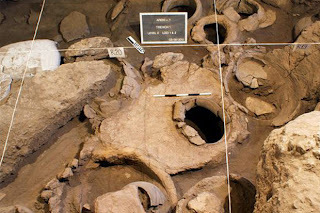 It turns out, the real birthplace of wine may be in a cave in Armenia. "An international research team says it has found the world's oldest winery in a paper published Tuesday in the peer-reviewed Journal of Archaeological Science.
" 'It's the oldest proven case of documented and dedicated wine production, stretching back the horizons of this important development by thousands of years,' said Gregory Areshian, co-director of the excavation and assistant director of UCLA's Cotsen Institute of Archaeology. "Areshian says that clay pots and vats discovered at a sprawling cave system in southern Armenia near the border with Iran shows signs of an organized effort to press and distill grapes during the Copper Age, about 6,000 years ago. "The roof of the cave had collapsed long ago, sealing in the rudimentary winery and preserving the remnants under an airtight layer of rock and other debris, leading to the remarkable find. "The team, led by Hans Barnard from UCLA, found a simple wine press, vats with residue, remnants of grape vines and seeds, and a small cup that might have been used to sample the goods. "The press and wide shallow vat are similar to foot-stomping type equipment used by people throughout the region even up into the 19th century. "The wine might have tasted similar to modern vintages as well. Botanists examining the find say it was the species Vitis vinifera, the same one used to produce the vast majority of wine today. "Areshian says the wine would be comparable to a modern unfiltered red wine, and may have had a similar taste to a merlot. "The oldest previously known evidence of wine dates to about 5400 BC and was discovered at a site called Hajji Firuz in the northern Zagros mountains, where McGovern has found jars with traces of tartaric acid crystals, a chemical marker for wine. "The oldest previous evidence of grape seeds and other organic materials dates to around 3150 BC and was found in the tomb of the Egyptian king Scorpion I. "The oldest wine press is much younger, found in the West Bank and dating to about 1650 BC.
" '99% of the wine we drink today stems from that earliest grapevine domestication event that now seems clearly to have taken place in that region,’ says McGovern, author of Uncorking the Past, a history of ancient wine-making. "Not much is known about the people who distilled and drank the wine. But the study's authors say it's clear that it was probably meant for ceremonial purposes, and not for getting drunk on.
" ‘This find shows that there was a high degree of agriculture and horticultural skill even back in 4,000 BC,’ says Areshian. ‘Producing this wine would have been high technology of the time incorporating detailed knowledge of watering cycles, pruning the vines, how to deal with pests and the fermentation process itself, which is more complex than brewing beer.’ "
This research was sponsored by UCLA and the National Geographic Society.